I guess with Halloween coming, I shouldn’t be so surprised that these have regained some popularity. They’re one of the more unusual ‘stones’ I get requested to wrap. They’re fun and creepy at the same time. Recently I’ve been asked to do 4 pendants, 2 rings, and if I can find a matched set, a pair of earrings……Not all by the same person of course…. 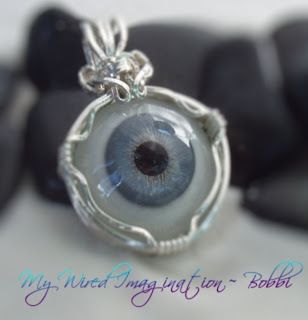 The first request was for this blue ‘taxidermist eye’ in Sterling Silver…..
Am I the only one who thinks buying ‘human styled’ eyes from a Taxidermist, just a little disturbing? Oh well no matter – I’m sure they’re meant strictly for crafts, and hobbies….yeah…moving on….. 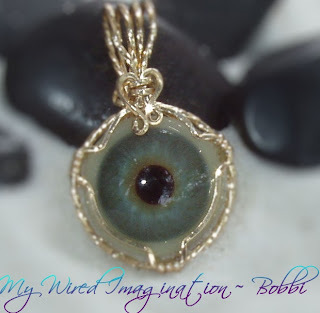 Shortly after that came a request for a wire wrapped pendant in 14k GF using one the few remaining real “Prosthetic Eyes” I have left. Now before you become totally grossed out, they have never been ‘used’ – they come to me as ‘rejects’ – wrong color – wrong size – that sort of thing. When I get them, they are still ’round’, and have to be carefully cut down to cab shape…… Sad to say, even after hours of scouring the internet for another supplier, the only ones I have seen, are a few outrageously priced ones on $bay….. The few I have left in my shop, I’m afraid are “it”. 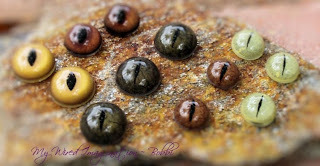 The remaining custom requests (so far), are oddly enough, going to be Christmas gifts for a friends Daughter, in the dark ‘alligator’ taxidermist eyes. I would love to be a fly on the wall, when those gifts are opened…….